NOTE TO READERS: Charts will continue to be posted as usual, but due to our coverage of the Toronto Film Festival, for the next week all text and responses to comments/requests will be delayed, potentially for a day or more. Things will be back to normal on Monday, September 18. NETWORK FINALS: There were no changes from the preliminary numbers for Monday. CABLE HIGHLIGHTS: TNT wasted no time canceling WILL after its season finale, which was down 0.01 to 0.09. 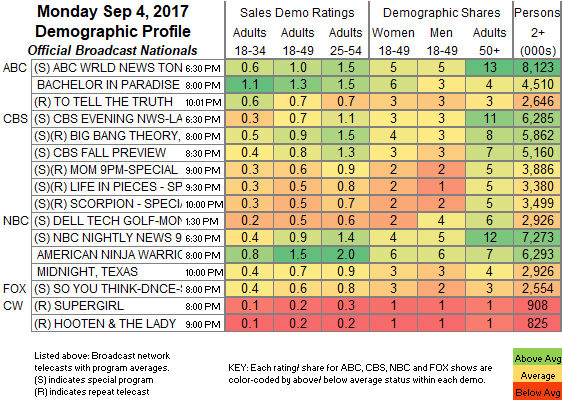 On AMC, the finale of LOADED grew by 0.03 to 0.05/145K, airing after PREACHER rose a tick to 0.33. On Discovery, DIESEL BROTHERS returned at 0.48, and GEAR DOGS premiered at 0.32. A&E’s special BIGGIE was at 0.34. TLC’s CHANDRA LEVY special was at 0.18. COLLEGE FOOTBALL continued to enjoy its reign before the NFL regular season arrives, with ESPN’s game on top of Monday cable at 1.67. USA’s WWE telecast was at 0.07/1.05/1.01, compared to last week’s 1.17/1.16/1.15. On VH1, LOVE & HIP-HOP dropped 0.16 to 0.92, and BALLER WIVES was down 0.06 to 0.54. On MTV, TEEN MOM rose 0.07 to 0.72, and SIESTA KEY was up 0.06 to 0.35. On Bravo, REAL HOUSEWIVES OF ORANGE COUNTY slipped 0.04 to 0.60, and REAL HOUSEWIVES OF DALLAS was up 0.04 to 0.31. 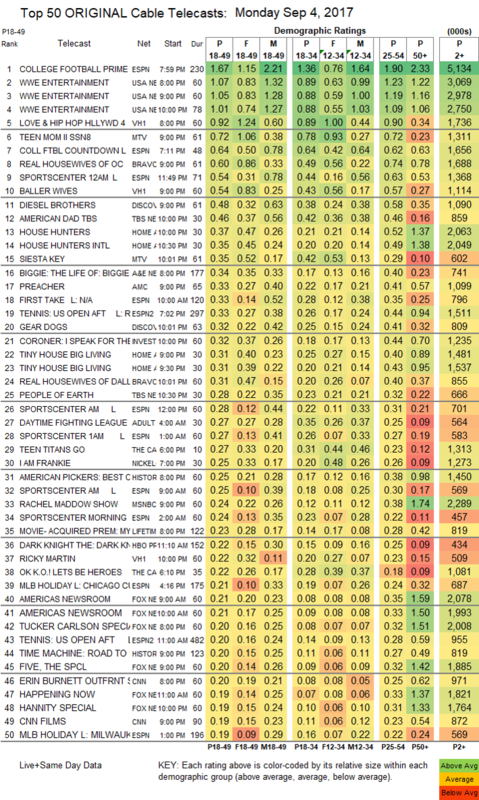 On TBS, AMERICAN DAD lost 0.06 to 0.46, and PEOPLE OF EARTH was down 0.03 to 0.28. On HGTV, HOUSE HUNTERS gained 0.05 to 0.37, HOUSE HUNTERS INTL was up 0.03 to 0.35, and TINY HOUSE BIG LIVING was at 0.31/0.31, compared to last week’s 0.34/0.29. On ID, THE CORONER climbed 0.06 to 0.32. Adult Swim’s 4AM DAYTIME FIGHTING LEAGUE was at 0.27. Food Network’s I HART FOOD fell 0.05 to 0.16.